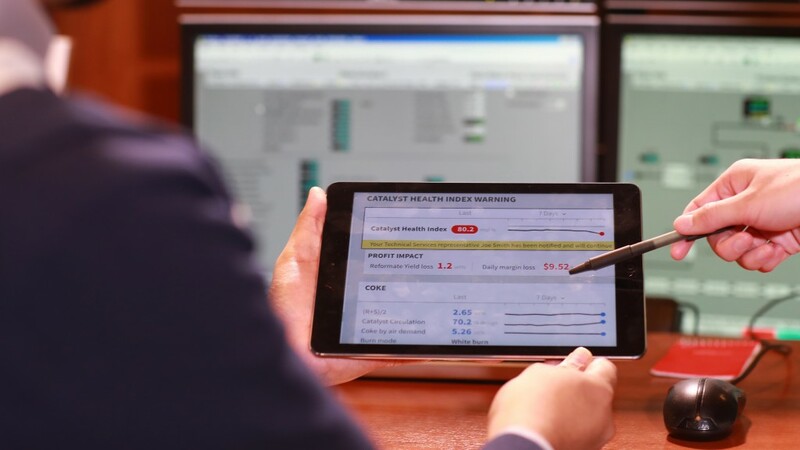 Honeywell and Wood will work together through the Honeywell Connected Plant platform to commercialize digital services that help refiners and petrochemical manufacturers make their operations safer, more efficient and more reliable. Honeywell UOP, a leading provider of technologies for the oil and gas industry, has partnered with Wood to develop Connected Plant capabilities for Wood's Foster Wheeler SYDEC Delayed Coking technology that converts heavy oil fractions into fuel-range distillates and other products. Honeywell UOP recommends Wood's Delayed Coking process to refining customers that require a coking technology. Wood has designed and engineered more Delayed Cokers globally than any other technology provider or engineering contractor. "Honeywell is a strategic partner in the connected plant space and together, we are ideally positioned to deliver the digital services our customers need," said Bob MacDonald, CEO of Wood's Specialist Technical Solutions business. "With this partnership, our customers will experience improved profitability through software-enabled services that guide the efficient operation of Delayed Coking and other related processes." "This alliance greatly expands the reach of the Honeywell Connected Plant by adding Wood's technology to our ecosystem," said Zak Alzein, vice president and general manager of Honeywell's Connected Performance Services business. "With this agreement, Wood can offer connected services to its Delayed Coking customers, and Honeywell will embed Wood's Delayed Coking digital twin into the Honeywell Connected Plant platform." Wood is a global leader in the delivery of project, engineering and technical services to energy and industrial markets. It provides performance-driven solutions throughout the asset life cycle, from concept to decommissioning across a broad range of industrial markets, including the upstream, midstream and downstream oil and gas, power and process, environment and infrastructure, clean energy, mining, nuclear, and general industrial sectors. The newly released ENI58PL series incremental rotary encoder from Pepperl+Fuchs offers incredible efficiency for a wide range of applications. IO-Link enables custom configuration, making it possible to commission machinery and equipment even faster. ENI58PL boasts flexible configuration options and a wide range of use cases-from classic industrial applications to special engineering. IntelliView Technologies Inc., a leader in AI-powered computer vision systems for industrial detection and alerting applications, has rolled out the latest software update for its IIOT monitoring platform, the IntelliView Vision System (IVS) 5.0. In becoming the exclusive sales & service source for SpectraSensors gas analyzing technology in Canada, Endress+Hauser is filling a need for solutions-based approaches tailored to each application measuring contaminant levels in natural gas and gas processing operations, refineries and chemical plants. Swagelok, a provider of fluid system products, assemblies, and services, has announced the release of a new low-temperature seal option. The new seal, a product expansion for the company's RHPS Series pressure regulators line, is designed to maintain a strong seal in cold climates and applications where significant cooling occurs due to high pressure drop. Comprised of low-temperature-resistant nitrile material, these regulator components are ideal for use even in environments with extensive presence of hydrocarbons, such as at large industrial gas suppliers' facilities where climate control may not be an option. POSITAL has added a new communications interface for its innovative Dynamic TILTIX series - making it even easier to use these smart and rugged instruments in mobile machinery and heavy duty construction vehicles. Now available with either CANopen or SAE J1939 interfaces, these acceleration-compensated tilt sensors are able to deliver accurate measurement under the harshest operating conditions, including rapid motions, shock and vibration loadings. Honeywell announced the latest release of its change management software, offering users across the process industries significant performance and time savings benefits. Honeywell Trace R130 delivers daily snapshots of control system configuration, changes and engineering anomalies that help amplify users' situational awareness, enabling optimization of system management. Dynatrol CL-10GH Liquid Level Detector is the latest addition to the reliable Dynatrol line of high, intermediate and low point level detectors for liquids or slurries. It has no moving parts, floats, diaphragms or packing glands to deteriorate. Successful applications in the Petroleum Chemical Industry include liquid hydrocarbons: (1) toluene hexane (2) ethanes (3) glycols (4) butadiene. AW-Lake Company introduces its new PCU Series of Controllers that connect with Vogtlin or any thermal mass flow meter or controller to provide a local display of flow output. Serving as a single- or multi-channel mass flow controller with up to four channels, the PCU instruments support multiple unit networked operations. A large, high-contrast backlit display offers easy-to-read views of process variables and programmed setpoints for each connected device on one screen. NewTek Sensor Solutions expanded the capabilities of its DC LVDT technology with 4-20mA output capabilities to meet the needs of industrial monitoring and feedback applications. In addition to offering 4-20 mA versions of its free-core and spring-loaded LVDTs, the company customizes 4-20mA position sensors to customer specifications. INOR Process AB announces the INOR IPAQ C/R330 universal temperature transmitter, a modern, isolated, universal temperature transmitter developed for maximum flexibility, accuracy and reliability. Compatible with RTD and thermocouple sensors, Ω and mV inputs, the IPAQ C/R330's robust design offers high vibration resistance and noise immunity, guaranteeing reliable and accurate operation under the most demanding conditions. INOR Process AB announces a whole new way to configure and monitor temperature transmitters without supply voltage and cables. Operators can connect to the transmitter with a smartphone or tablet using near-field communication (NFC) or Bluetooth and configure through the new INOR Connect app. Using wireless communication means operators never need to remove the signal converter from the process. Now available are the INOR 330 series temperature transmitters, and the INOR 530 series, fully compatible with HART 7. Pfannenberg, a global manufacturer of thermal management and signaling technologies, highlights the availability of rugged PATROL Series Flashing Sounders for fixed gas detection alarming. Designed to alert personnel of an evacuation when there is presence of hazardous gas, these combined signaling products increase safety when used with ammonia (NH3), carbon dioxide (CO2), freon (R22), methane (CH4), or chlorine (CL2) gas monitoring systems in energy generation, wastewater treatment, landfill applications, food and beverage manufacturing, refrigeration, gas production, agricultural chemical use and storage, and other industrial applications. With the launch of its state-of-the-art ST80 Series Thermal Mass Flow Meter featuring breakthrough Adaptive Sensor Technology (AST), the process industry's air/gas flow measurement bar has been reset higher again for rangeability, accuracy, extended service life, reliability and application-matched solutions by Fluid Components International (FCI). Aalborg Instruments' DPC series precision digital mass flow controllers provide accurate and stable control of mass flow rates, of process gases. The National Oilwell Varco (NOV) VapR Dissolvable Frac Plug is a fully dissolvable frac plug that provides a dependable method for temporary zonal isolation during frac operations in both vertical and horizontal completions. The PEM-ZR Economy StabiliZR gauge is now available from Winters. The StabiliZR version of the PEM economy gauges is available in 1.5" (40mm) to 4" (100mm) dial sizes, bottom and back connections from 1/8" to 1/4" NPT and ranges from vacuum to 5,000 psi/kPa. PEM-ZR is a general purpose gauge for plumbing, hydraulic and other applications where pulsation and vibration are present. Siemens will be placing smart solutions for the industry-specific implementation of Industrie 4.0 at the heart of its Hannover Messe 2019 presentation under the banner "Digital Enterprise - Thinking industry further!" Over an exhibition space of around 4,000 square meters in Hall 9, Siemens will be showcasing these solutions with an array of new additions to its Digital Enterprise offering designed to enable the digital transformation of the discrete and process industries. FLIR Systems, Inc. has introduced what it calls the industry's first high-definition (HD), handheld optical gas imaging (OGI) camera, the FLIR GF620. Designed for oil and gas industry professionals, the GF620 camera sets a new standard for detecting and visualizing invisible leaks of hydrocarbons, such as methane, and common volatile organic compounds (VOCs). With four times the pixels of previous models, the HD resolution GF620 helps inspectors survey for fugitive hydrocarbon emissions from further, safer distances than possible with lower-resolution OGI cameras. Schneider Electric has released the Global Digital Transformation Benefits Report 2019, presenting concrete evidence of the power of digitization across the spectrum of global industry, commerce and the public sector. This evidence takes the form of deep, quantifiable, business benefits derived from a repository of 230 customer projects Schneider Electric completed in the last five years across 41 countries - all employing the company's architecture and platform, EcoStruxure. The FLIR GF77 Gas Find IR is FLIR Systems, Inc.'s first uncooled thermal camera designed for detecting methane. This handheld camera offers inspection professionals the features they need to find potentially dangerous, invisible methane leaks at natural gas power plants, renewable energy production facilities, industrial plants, and other locations along a natural gas supply chain. The GF77 provides methane gas detection capability at roughly half the price of cooled gas inspection thermal cameras, to empower the oil and gas industry to reduce emissions and ensure a safer work environment. Bedrock Automation, the maker of the world's most secure open industrial control system (ICS), has established a partnership agreement with Wood, a globally recognized integration provider. Under the agreement, Wood's automation and control group will deliver Bedrock Open Secure Automation (OSA) to its clients in energy and industrial markets. Wood has active membership in The Open Process Automation Forum, which is focused on the development of a standards-based, open, secure, interoperable process control architecture. The rising interconnectivity among devices in industries is opening up the market for wireless gas sensors. These sensors can be installed in smartphones and are designed to support Bluetooth, Wi-Fi, near-field communication, and other wireless connections. Their portability, low power requirements, and high-performance potential make them ideal for Internet of Things (IoT) applications, especially in critical and hard-to-reach areas in mining and oil & gas. With further improvements in battery life, ruggedness, form factor, and standardization, wireless gas sensors will find a wider application and revenue-generation potential. The new Turbimax CUS50D from Endress+Hauser is a highly reliable absorption style sensor for measuring turbidity and suspended solids measurement in hostile environments. It has a robust polymer measuring surface ideal for aggressive media including salt water. The unique dual path length design (5 & 10 mm) ensures effective measurements through a large range of applications including very dark liquids and sludges. This special measuring surface minimizes the risk of dirt accumulating and any surface contamination can be eliminated by the sensor's optional air cleaning system. Engineers tasked with finding a green solution to waste gas emissions from hydrocarbon storage tanks during loading and unloading operations will find the ST100 Series Thermal Flow Meter from Fluid Components International (FCI) supports tank vapour recovery systems, which help reduce greenhouse gas emissions. KROHNE, Inc. announces the availability of the new OPTISWIRL 4200 vortex flowmeter, ideal for advanced energy management systems. Used to measure both conducting and non-conducting liquids, gases and steam, the new OPTISWIRL 4200 vortex flowmeter can be used for internal monitoring of energy flows for saturated and superheated steam or hot water, and heat metering applications. It is also a perfect choice for such applications as steam boiler monitoring, burner consumption measurement, or compressed air network monitoring, including free air delivery (FAD) applications. AMETEK has broadened its AMEVision communication and display system capabilities to include the 3050 series of moisture analyzers. Originally designed for WDG-V analyzers, the AMEVision system provides real-time moisture measurements and trend data while also detailing a variety of maintenance and troubleshooting information. KROHNE, Inc. announces that it has begun manufacturing the OPTIMASS 6400 twin bent tube Coriolis mass flowmeter at its newly opened state of the art flow and level instrument manufacturing and calibration facility located in Beverly, MA. The OPTIMASS 6400 is ideal for standard liquid and gas applications in the chemical and petrochemical, oil and gas, pharmaceutical, food and beverage, and energy and power industries. The OPTIMASS 6400 is equipped with a new signal converter that features advanced device and process diagnostics, compliant to NAMUR NE 107. Electro Static Technology, the manufacturer of AEGIS Shaft Grounding Rings, and specialist in low- to medium-voltage motor protection technology, has appointed Matthew Laufik as Global Sales Manager. In this new role, Mr. Laufik will be responsible for the sales of AEGIS products to motor repair shops, motor manufacturers and end users in a range of processing industries worldwide through the company's international sales organizations and distribution network. He will also manage all sales, marketing, and customer service personnel. Barben Analytical has introduced OXYvisor, its second-generation process oxygen analyzer, which optically measures oxygen in either the gas or liquid phase. The Dynatrol CL-10GP Proportional Level Detector is designed specifically to control liquid levels in pilot plants, processing, small vessels, or anywhere it is necessary to obtain proportional level control over a precise range. The EC-103C(G) Control Unit is paired with the Detector and can activate electro-pneumatic transducers, valve positioners, indicators, controllers or other DC current devices. Allweiler, a CIRCOR International brand, and a worldwide supplier of pumping solutions for chemical engineering applications, announces the IN-1000 condition monitoring device, ideal for pumps in operationally critical and environmentally sensitive chemical engineering applications. With one master and up to 10 satellite modules per network, the IN-1000 lets operators monitor as many as 11 pumps at once. Built-in features include a two-level warning and alarm system, logging of sensor data, and remote monitoring with a smartphone app. The IN-1000 is available with ATEX certification for use in EX zones. Festo's new EFSD electric stopper provides exceptional stop-and-release functionality in the movement of product from station to station in assembly and transfer systems. With benefits such as a lower installation cost, faster commissioning and operational energy savings, it is the ideal choice in stop-and-release wherever an electric actuator is preferred to a pneumatic option. NewTek Sensor Solutions offers an extended series of spring-loaded LVDTs that provide accurate dimensional feedback for a variety of position measurement and quality assurance applications including go/no-go measurements, automotive part quality testing, roller position/product thickness control, TIR measurements and material testing under stress.